You, Me and Movies: Hellboy reboot? A few months ago I participated and retweeted a poll on my Twitter account. 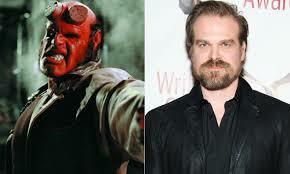 It was made my director Guillermo Del Toro, who made the first two "Hellboy" movies. He wanted to know if there was any fan interest in seeing a third "Hellboy" movie. There was plenty of interest, it turns out. Because based on votes, he could have easily made a third "Hellboy" movie. It turns out that there will be third "Hellboy" movie. But it won't be made by Del Toro, it won't star Ron Perlman and it will be a reboot of the franchise. Yep, Mike Mignola, the original Hellboy writer, has taken the rights back and is planning an R-rated "Hellboy" reboot. David Harbour, who has starred in such things as "The Green Hornet," "Black Mass," "Stranger Things," and "Suicide Squad" will star in the title character. I like Harbour as an actor, I find him really underrated, and I think he will do a good job. He's due for a movie like this, especially since he was a candidate to play Cable in the upcoming Deadpool sequel. But there was something special watching Ron Perlman and Guillermo Del Toro working together on this property. Although I do understand that Perlman may be getting too old to play the part. Its tough because its clear Del Toro still had interest in this character, and it kills me that after "Hellboy 2: The Golden Army" we wont see the massive conclusion Del Toro had planned for the character. I know internet fandom has been in the uproar over this today. It definitely stinks. I just hope that this ends up good. I never read any Hellboy comics, so I don't know about the tone, but the writer is in control so that has to be good, right? Trailer for "Batman and Harley Quinn"